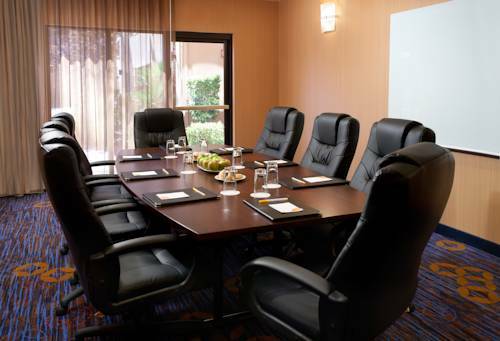 Whether conducting business or creating memories, Courtyard Las Vegas Summerlin makes it easy to spur success. Savor the famous casinos, dining and nightlife the Las Vegas Strip is known for, or swap the street lights for stunning views at nearby Red Rock Canyon. Our hotel also offers easy access to premier golf courses, shopping centers and sports complexes, perfect for entertaining all ages. Continue the fun when you return to our outdoor pool, or work up a sweat in our fitness center, open 24 hours a day. Feeling hungry? Head to our on-site bistro restaurant for breakfast and specialty Starbucks beverages in the morning, then return in the evening for dinner and cocktails. When it's time to call it a night, return to relaxation in our modern rooms and suites. With complimentary high-speed Wi-Fi, ergonomic workspaces and luxurious bedding, you'll find it easy to keep up with your daily routine on the road. Find success in Nevada when you reserve your upcoming stay at Courtyard Las Vegas Summerlin. The Bistro Eat. Drink. Connect. : Enjoy a restaurant in North Las Vegas with refreshing breakfast choices in the morning and a variety of dinner and cocktail options in the evening. The Bistro also offers specialty beverages made with Starbucks coffee to help you get a jump on the day. Mountain View Hospital and Medical Cntr.